The leftish press and Hollywood climate experts have been claiming that the recent rash of dangerous hurricanes is due to global warming. Dr. Roy Spencer, U.S. Science Team leader for the Advanced Microwave Scanning Radiometer flying on NASA’s Aqua satellite, takes exception to these claims in a short blog post and in a new E-bookavailable from Amazon for $2.99. The E-book is about 11,000 words long and contains 17 illustrations. I recommend you read it. In the book, Spencer explains the origin of hurricanes and gives a history of U.S. hurricanes from colonial times to present time, including comments on hurricanes Harvey and Irma. Spencer notes that geological studies of sediments in coastal lakes in Texas and Florida show that “catastrophic hurricane strikes were more frequent 1,000 to 2,000 years ago than in the most recent 1,000 years.” Hurricanes making landfall in Florida show a downward trend in both number and intensity (that trend includes hurricane Irma). Spencer says that hurricanes in tropical Atlantic, Caribbean, and Gulf of Mexico are not limited by sea surface temperatures. If you were to go up inside the eye at the altitude where jets fly, you would find the air temperature there is 10 or 20 deg. F warmer than normal for that altitude. This warmth is caused by air being forced to sink in response to rising air in the showers and thunderstorms surrounding the eye. This ‘subsidence warming’ is a universal feature of all precipitation systems, but only in hurricanes is it highly concentrated into one relatively small area. All of the warm rising air in billowing rain clouds must be exactly matched by sinking air elsewhere, and in the case of hurricanes, that sinking air is most concentrated and intense in the eye of the storm. For more common rain systems, the warming is much weaker as it is spread over huge areas hundreds or even thousands of miles in diameter. Only a few miles away from the eye is the heavily raining eyewall of the hurricane; this is where the strongest surface winds occur. Spencer also has a chapter on “The Effect of Sea Level Rise on Hurricane Storm Surge” in which he shows that sea level rise has been mostly if not entirely natural, with no convincing evidence that it has accelerated from human-caused global warming. Frank shows that neither of the above contentions is true, read more. The score so far, at half time, is six tropical storms and no hurricanes as of this writing. But the season is not over. 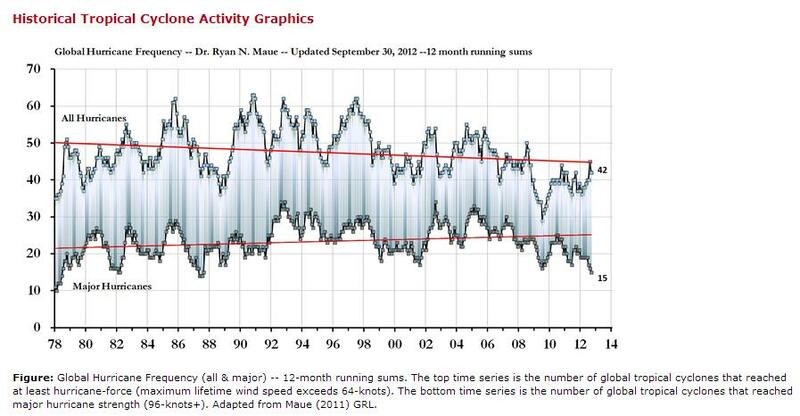 NOAA says the season usually peaks around September 10, and we still have three months to go. Yes, “Predictions are hard, especially about the future.” We will just have to wait to see how the second half plays out. UPDATE: On September 11, tropical storm Humberto officially became a hurricane with sustained winds of 80 mph. It was centered about 340 miles (550 kilometers) west of the southernmost Cape Verde Islands and was moving north at 9 mph (15 kph). While storm damage makes the news, the damage is largely an artifact of our propensity for building infrastructure in the areas subject to extreme weather rather than any imagined increase in such weather. You can download the 582-page report here: http://www.ipcc-wg2.gov/SREX/ That page allows you to download either the Summary for Policy Makers (11.8 Mb) or the full report (44 Mb). The press often prints dire predictions of the consequences of global warming when reporting damage from land-falling hurricanes. (For instance see stories here, and here, and here, and here) and some insurance companies are raising their rates (see here.) However, the increased storm damage is an artifact of our tendency to build more stuff in the historical path of storms rather than an increase in storm frequency or intensity. In recent decades, economic damage from tropical cyclones (TCs) around the world has increased dramatically. Scientific literature published to date finds that the increase in losses can be explained entirely by societal changes (such as increasing wealth, structures, population, etc) in locations prone to tropical cyclone landfalls, rather than by changes in annual storm frequency or intensity. However, no homogenized dataset of global tropical cyclone landfalls has been created that might serve as a consistency check for such economic normalization studies. Using currently available historical TC best-track records, we have constructed a global database focused on hurricane-force strength landfalls. 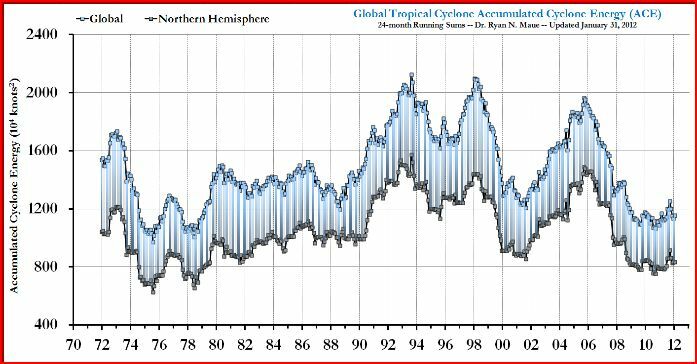 Our analysis does not indicate significant long-period global or individual basin trends in the frequency or intensity of land falling TCs of minor or major hurricane strength. This evidence provides strong support for the conclusion that increasing damage around the world during the past several decades can be explained entirely by increasing wealth in locations prone to TC landfalls, which adds confidence to the fidelity of economic normalization analyses. The paper above speaks of land falling hurricanes. The total number of detected hurricanes, land falling or not is also not increasing. 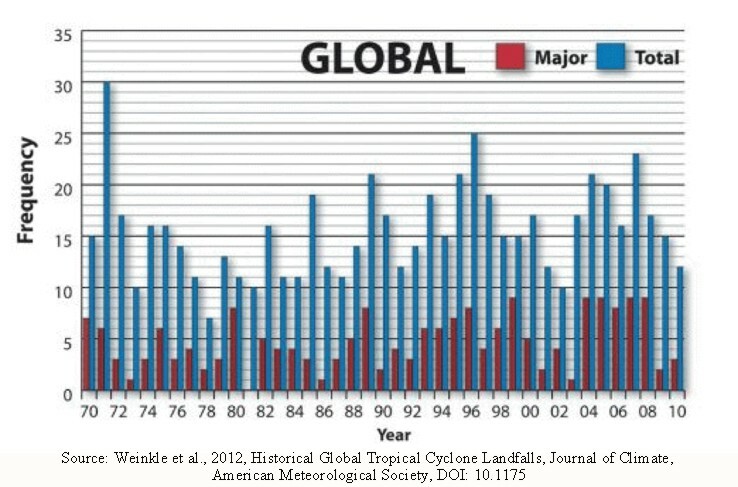 (Maue, R. N. (2011), Recent historically low global tropical cyclone activity. , Geophys. Res. Letts. VOL. 38, L14803, 6 PP., 2011). 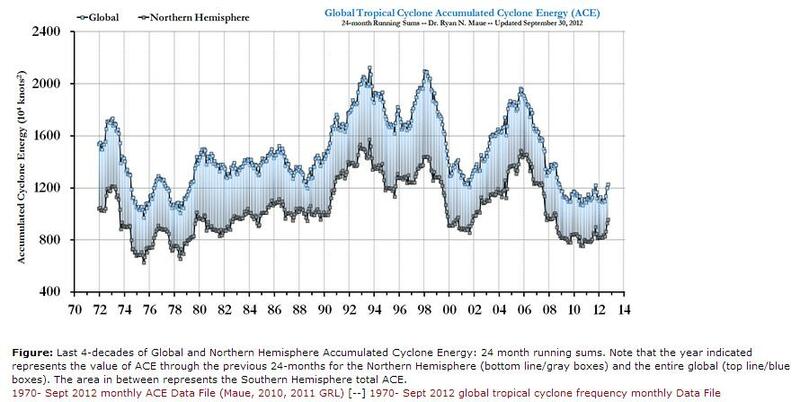 The intensity of hurricanes is also not increasing as the planet warms. Hurricanes are natural heat engines. They extract energy from the moist, warm air over the tropical and subtropical oceans, liberate this energy in the process of forming clouds and rainfall, but lose most of this energy in the cold exhaust of the cyclone in the upper part (~8 mi, or ~12 km) of the atmosphere. A very small percentage (less than 1%) of this released energy is used to warm the air within the hurricane, drop the air’s density and pressure, and cause the swirling winds to spin faster and faster. It’s also important to point out that ocean temperatures are not the only factor that is crucial in knowing which disturbances will develop into a tropical storm and which systems will intensify to become extremely strong hurricanes. Other physical “ingredients” in the hurricane “recipe” include moist air and numerous thunderstorms, weak vertical wind shear (the difference in winds near the ocean versus the upper part of the atmosphere), and a triggering disturbance (in the Atlantic this is often from an African easterly wave in the atmosphere). All climate models predict that for every degree of warming at the ocean that the air temperature aloft will warm around twice as much. This is important because if global warming only affected the earth’s surface, then there would be much more energy available for hurricanes to tap into. But, instead, warming the upper atmosphere more than the surface along with some additional moisture near the ocean means that the energy available for hurricanes to access increases by just a slight amount. Moreover, the vertical wind shear is also supposed to increase, making it more difficult (not easier) for hurricanes to form and intensify. Looks like another global warming scare story is not supported by facts. Posted in Climate change and tagged ACE, cyclones, frequency, global warming, hurricanes on February 23, 2012 by wryheat2. The Center for the Study of Carbon Dioxide and Global Change in Tempe, Arizona, has just issued a major report that compares projections from climate models to real world observations. The 168-page report (2.5Mb) may be downloaded here. In true Mencken style (“The whole aim of practical politics is to keep the populace alarmed by menacing it with an endless series of hobgoblins, all of them imaginary.” ) an AP story on the front page of the Arizona Daily Star speculates on dire consequences that may occur if a hurricane meets the oil slick in the Gulf of Mexico. Most hurricanes span an enormous area of the ocean (200-300 miles) — far wider than the current size of the spill. If the slick remains small in comparison to a typical hurricane’s general environment and size, the anticipated impact on the hurricane would be minimal. The oil is not expected to appreciably affect either the intensity or the track of a fully developed tropical storm or hurricane. The oil slick would have little effect on the storm surge or near-shore wave heights. The high winds and seas will mix and “weather” the oil which can help accelerate the biodegradation process. The high winds may distribute oil over a wider area, but it is difficult to model exactly where the oil may be transported. Movement of oil would depend greatly on the track of the hurricane. Storms’ surges may carry oil into the coastline and inland as far as the surge reaches. Debris resulting from the hurricane may be contaminated by oil from the Deepwater Horizon incident, but also from other oil releases that may occur during the storm. A hurricane’s winds rotate counter-clockwise. Thus, in very general terms: A hurricane passing to the west of the oil slick could drive oil to the coast. A hurricane passing to the east of the slick could drive the oil away from the coast. However, the details of the evolution of the storm, the track, the wind speed, the size, the forward motion and the intensity are all unknowns at this point and may alter this general statement. Evaporation from the sea surface fuels tropical storms and hurricanes. Over relatively calm water (such as for a developing tropical depression or disturbance), in theory, an oil slick could suppress evaporation if the layer is thick enough, by not allowing contact of the water to the air. With less evaporation one might assume there would be less moisture available to fuel the hurricane and thus reduce its strength. However, except for immediately near the source, the slick is very patchy. At moderate wind speeds, such as those found in approaching tropical storms and hurricanes, a thin layer of oil such as is the case with the current slick (except in very limited areas near the well) would likely break into pools on the surface or mix as drops in the upper layers of the ocean. (The heaviest surface slicks, however, could re-coalesce at the surface after the storm passes.) This would allow much of the water to remain in touch with the overlying air and greatly reduce any effect the oil may have on evaporation. Therefore, the oil slick is not likely to have a significant impact on the hurricane. All of the sampling to date shows that except near the leaking well, the subsurface dispersed oil is in parts per million levels or less. The hurricane will mix the waters of the Gulf and disperse the oil even further. The experience from hurricanes Katrina and Rita (2005) was that oil released during the storms became very widely dispersed. Besides NOAA, other sources say that storms disperse and/or bury oil already on the beach. Tar balls are common on Galveston Island beaches but less so after a storm. The Marshes should fare the same way. If anything, hurricanes have a tendency to leave beaches cleaner than they found them. The UN’s Intergovernmental Panel on Climate Change (IPCC) claims that all of its reports and predictions are based on strictly peer-reviewed scientific papers. Well, not exactly. Recent investigations have shown that many IPCC reports were based on everything from magazine articles, telephone conversations, and propaganda from radical environmental groups. The IPCC claim that Himalayan glaciers would melt by 2035 was based on an unverified magazine article and the IPCC knew it. Nevertheless, the IPCC let the statement stand for purely political purposes. In Chapter 6 of 4AR, the IPCC claims that coral degradation is caused by global warming. The source for this claim is promotional literature by Greenpeace. The IPCC also based reports on solar and wind power on Greenpeace documents.